Many many times I have seen the bride walk down the aisle with custom or at least very expensive shoes, but seldom does the groom rise to the occasion to match her. Jakub, what can I say. Oh those shoes! Jakub and Sarah are such a beautiful couple and they both have a love for fashion. 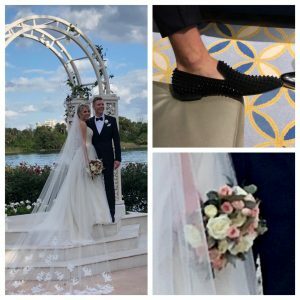 Jakub told me at rehearsal that he really loves to dress up for his bride and it was ever so evident when on their wedding day he walked down the aisle in the Walt Disney World Wedding Pavilion, wearing black slippers cover in Swarovski crystals by Christian Louboutin. NOW THAT IS A FASHION STATEMENT. Hannah from Disney Fairytale Weddings coordinated the day for the beautiful couple. After photographs at the Grand Floridian Resort the groom and his posse headed over to the Wedding Pavilion via a stretch white limousine, while Sarah arrive later in Cinderella’s carriage, pulled by six white horses. The flowers by the Walt Disney World Florist, for the couple were a blush and darker pink and truly accentuated the couple’s choices. Disney Fine Art Photography captured every moment of the couple’s day. We wish for them their very own happily ever after!